David Brown Automotive has shown its unique handcrafted GT car for the first time. It was also revealed that this exciting and highly anticipated new car, which is designed, engineered and hand-crafted in Britain, will be called Speedback: a name which reflects the elegant yet purposeful lines of the V8 powered sports coupé. 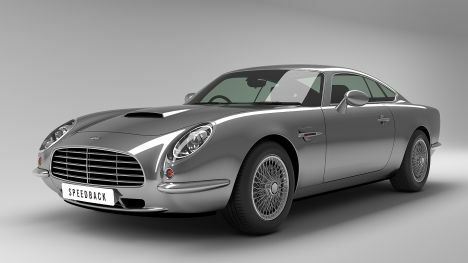 The Speedback, which has strong design cues from the Aston Martin DB5 as well as from more contemporary supercars, will be built on the Jaguar XKR platform, utilising the same 5 litre supercharged V8 and six-speed transmission. Performance figures are a 0-60mph time of under 5 seconds and a top speed of 155mph, suggesting that the ethos behind the Speedback is GT rather than supercar, rather like an Aston Martin DB5 in fact. The name of David Brown and the similarity to the DB5 is purely coincidental, although ironically both holders of the name, past and contemporary, had strong involvements in tractors and earth-moving equipment respectively. The car will be officialy launched on April 17th 2014, at the Top Marques Show in Monaco, when the price will be announced. As David Brown Automotive has already said, this will between £100K and £1 million.